It’s not easy coming up with a unique enough blend of musical styles so that someone as well-traveled as yours truly is struck by the album's individuality. 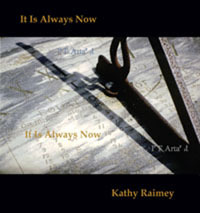 It's this quality which makes piano/keyboard player Kathy Raimey's It is Always Now so special, though. Dexterously traversing from the opening ambient/spacemusic synth washes and twinkling starpoints of Sustainable Space to the later plaintive piano accented with udu drum rhythms of African Pearl (as well as many other songs), Raimey displays an uncommon ability in navigating through the disparate waters. While new age music fans may balk at the relative lack of overt continuity, it's a moot point from my perspective because the artist's "fingerprints" are easily discerned throughout the CD. Nothing here strays that far afield from the quiet reflective nature of the release (i.e. there are no techno numbers on the disc). Many Hands Make Light the Load gently walks down the road amidst soft piano and a just-right application of synth strings and is followed by the electronica "lite" of "Riverbend which blends classic new age music bell tones with pulsing electronic beats and flowing synth pads. Quiet Rain, the next track, is a gem, with minimal mournful piano, set against sampled udu drum rhythms (as in "African Pearl"); it’s a highly evocative piece, perfect to accompany a late afternoon rain shower outside. While Bear Dreams (described in the liner notes by the artist as "A soothing lullaby for times of hibernation") is quiet and serene enough to fall asleep to, it'd be a shame to do so because the melancholic song is suffused with deep feeling. The CD's next unexpected/atypical twist occurs on the next song, Heart Murmurs, which is a subdued mixture of fretless bass beats, subtle thumping bass drum rhythm, and quirky electronic effects. Despite its obvious difference from other songs here, the song is subdued enough that it doesn’t derail the album’s overall mood. The trait the artist exhibits here is what I referred to in the opening paragraph about her "fingerprints" being a unifying factor throughout It Is Always Now. Other tracks on the CD include an amalgamation of ambient textures and new age melodicism (Illumination), a pensive solo piano number (Break of Dawn), another exploration of piano mixed in with electronica textural rhythms (Soliloquy), and the title track, a vocal mantra (the mantra is the song’s title) set against a background of assorted chugging crackling electronic rhythms. While Raimey is in fine voice (she reminds me a bit of Claire Hamill circa Voices), the song itself is probably the weakest one on the album, although this judgment is colored by how good everything else here is. The mantra's downside is its length (four and half-minutes of "It Is Always Now" multi-tracked gets a bit much) as well as the electronics employed which lack a sense of melody supplying only textures and beats. The album closes with a reprise of the opening track, this time titled Sustainable Space Two and nearly double in duration (close to six minutes long versus the first song's three minute running time). It's a smart move on the artist's part as this is easily one of the CD’s best cuts. The mantra piece notwithstanding, It Is Always Now can be summed up with the words "delightfully different." The CD is not different in that the music itself is distractingly unique or too "out there" (although there is little here I"d refer to as cliche or derivative). It"s different in how Kathy Raimey expertly merges her electronica/ambient side with her softly melancholic new age side. The resulting music reveals an artist to keep a close eye on to see what she does next. Based on this album, it will be both worthwhile and unexpected. It Is Always Now is solidly recommended by this jaded music critic.